Crest Ridge Saddlery offers four distinct heritage saddles model, inspired by some of the greatest saddles in American history. These saddles are produced by Amish master craftsman, who are some of the finest saddle makers in the country. Each saddle is a work of art, yet sturdy enough for everyday use. All of our saddles are built using your measurements to order, allowing you to customize your saddle from our extensive list of saddle options. Each is uniquely designed to match needs of the gaited horse yet work just as well on stock horses and mules. Our saddle designs were inspired by working saddles from the ‘Old West’ which we modified to take advantage of modern technology and our years of experience in leading organized trail rides. In our flare trees, the gaited horse’s shoulder is free to move. Each saddle places the rider in the center balanced position that has been proven superior over centuries of riding. 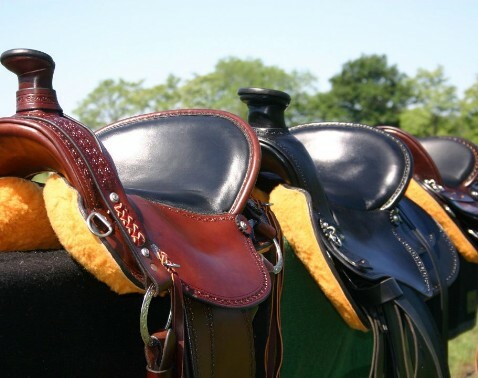 Our horse saddles offer a variety of rigging options to prevent galling and promote saddle stability. Crest Ridge Saddlery places a premium on rider comfort too. Our saddles have Supra-Cor padded gel-like seats covered with glove leather standard. We use only Wicket and Craig #1 leather, except for billets. For enhanced durability we use only stainless steel hardware and real Blevin's buckles. Our Heritage Saddles for horses and mules are the Encore, Bear Trap, Delzar, and Wade Old-Timer. Have you ever dreamed of owning a saddle that is truly a piece of art built by a master craftsman yet is tough enough to ride on the hardest trails and beautiful enough for the show ring? Now you can! Introducing the Encore Package available on Wade and Sentry saddles. One of the Amish master craftsmen working for Crest Ridge Saddlery built this saddle as a surprise birthday present for Debra. It is a testament to his skill and artistry. We will build yours with all of our expert saddle fitting services, uncompromising attention to detail, quality materials and everyday functionality of all of our saddles, finished with the detailed touches only possible for a master craftsman at the peak of his skills. Because the Encore is so personalized, please call for pricing or to order. 1-417-644-0091. Inspired by E. C. Lee's classic contest saddle, the Crest Ridge Bear Trap saddle is designed for the avid trail rider mounted on mules, gaited horses or stock horses. Riders in Bear Trap saddles were so successful, they were eventually banned from competition for giving the rider an unfair advantage. Crest Ridge Saddlery's Bear Trap saddle features a signature wide swell which is canted back towards the rider and is cut in at the ends, allowing the rider to lock into the saddle with their legs. The Bear Trap comes with Tapadero stirrups and pulling collar brackets. In addition, this sturdy saddle features a 3/4 SupraCor seat, and over-the-tree rigging that is fully adjustable from 7/8 to 5/8 rigging. This design will solve your galling problems. Please call or email for pricing. Inspired by classic mule saddles, the Delzar is designed for the avid trail rider mounted on mules, gaited horses or stock horses. The rigging is a combination of the classic Sam Staggs over the tree rigging with a braided hold back over the swell, engraved steel rigging, and a McClellan inspired rigging below. The Delzar features a 3/4 SupraCor seat and over the tree rigging that is fully adjustable from 7/8 to 5/8 rigging. There is also a cantle pouch. The Delzar comes with tapadero stirrups standard. 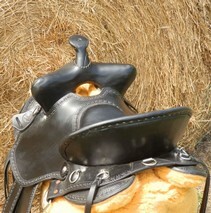 The Delzar is named for Lance Deloria of Delzar Farms, who purchased the original saddle. Our classic double skirted Wade Old-Timer saddle is an update of the heavy duty saddles used in the Old West. Endurance stirrups are standard on the Wade Old-Timer. A young cowboy named Clifford Wade had recently migrated from the East with his family and along with him was his favorite saddle. His saddle ’s pommel was almost non existent, it sat low and close to the horse, the rider sat deep with a high pencil roll cantle, the stirrups hung directly under the rider, optimizing a balanced seat position. Though it wasn't called such at the time, it was one of the earliest center-balanced western saddles. Another cowboy named Tom Dorrance took notice of the saddle Clifford was riding. Tom was so impressed with the saddle he had the tree replicated and a new saddle built to his specifications. Tom Dorrance named it the, Wade saddle. Tom was possibly the original natural horseman. His teachings over many years helped form what natural horsemanship is today.